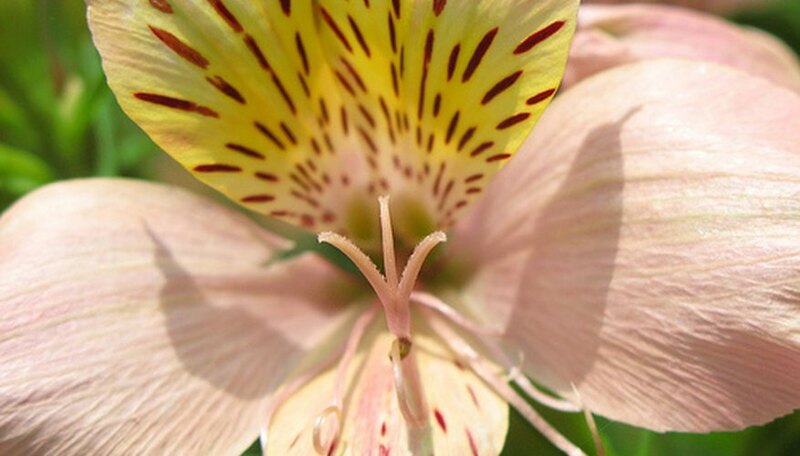 Alstroemeria, also known as the Peruvian Lily, is a perennial flowering plant native to South America. The plant flowers in the garden in mid-summer and produces lily-like blooms in colors of white, yellow, orange, pink, red and purple. The flowers are often streaked with darker colors and appear in loose clusters. Alstroemeria flowers are commonly used in arrangements and as cut flowers but are quite easy to grow in the home garden. Plants can be left undisturbed for years once planted, and require only minimal maintenance once established. Plant container grown alstroemeria plants in fall. Select a planting location with fertile, well-drained soil that receives full sun--except in very hot climates where some afternoon shade is necessary. Prepare the site by adding a 1-inch layer of organic compost and using a garden tiller or spade to incorporate into the soil. Dig the planting holes about 6 inches deep and slightly wider than the plant's roots. Place the alstroemeria plants inside, gently cover the roots with soil and water to compact. Space plants at least 12 inches apart. The plants will not flower until the following year, and new growth will not emerge until spring. Water alstroemeria plants regularly during the spring through early fall. Once per week is sufficient for plants grown in temperate climates. Water twice per week in dry periods or very warm climates. Alstroemeria is drought tolerant but will perform better with regular watering. Do not water in winter when the plant is in dormancy. Apply a 4-inch layer of mulch around the base of alstroemeria plants after the first hard freeze of autumn. Use insulating mulch such as evergreen boughs or straw. This will keep the roots insulated during cold temperatures. As long as the soil doesn't freeze to the depth of the roots, the plants will survive even harsh winters. Feed alstroemeria once every two weeks during spring using a balanced flower fertilizer. Refer to the manufacturer's directions for proper dosage and application. Water after applying to prevent root burn and to distribute the nutrients throughout the soil. Prune alstroemeria flowers after blooming has ended, usually in early fall. Use pruning shears to cut old flower stalks back to within 3 or 4 inches of the soil line. This practice will encourage root development and prevent the plant from setting seed. Do not cut back flower stalks if you wish alstroemeria to self-sow. Alstroemeria can be grown from rhizomes instead of container plants, but the rhizomes must be handled carefully and planted immediately upon receiving them in early spring. Plant rhizomes 8 inches deep in fall, and the plants will emerge the following spring.